Photo; Thanks to Madhav on Unsplash. A woman in our congregation was diagnosed with stage-four cancer some years ago. She was relatively young and suddenly found that she was gravely ill, which had not been a part of her life’s plan. She had a young daughter, and she had looked forward to being a loving mother to her as she grew up. She was reluctant to enter the world of allopathic medicine, with round after round of chemo, and she decided to opt for alternate methods, including the power of prayer. He didn’t force the issue: “I think it would be foolish – you must seek medical treatment!” He left it to her to decide. The important question was not whether it could be done, but whether she could do it. This was always Swamiji’s way of working with us: instead of imposing a mental image on us of what we ought to be doing, he would encourage us to move forward starting exactly where we were. Our reading today tells us that we can achieve great things by the power of prayer, if we can focus all of our energy and attention and call on God with deep, one-pointed concentration. It’s a promise that people very often misunderstand, assuming, “Well, if the saints can pray and receive God’s help, I can do it, too.” But there is a great deal of difference between simply asking with the mind, and exerting the kind of dynamic energy and deep feeling that will draw a response from God. Paramhansa Yogananda told how, when he was teaching the children at his school in Ranchi, India, he would take them across a dangerous waterfall. Before they crossed, he would challenge them, “Do you believe in God?” With great enthusiasm, they would shout the response, “Yes, we believe in God!” And they would pass safely, with the divine power to protect them. 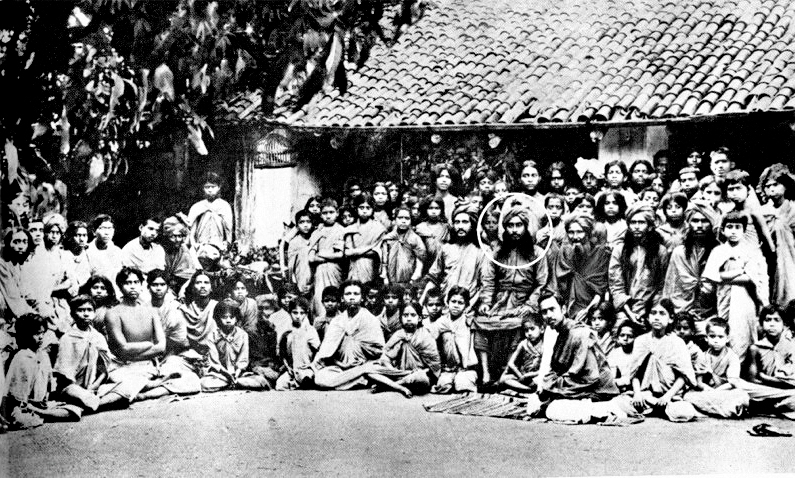 Paramhansa Yogananda with students at his school in Ranchi, 1918. Clearly, there was a great deal going on behind the scenes. In response to the children’s enthusiastic affirmation, Master was able to extend a divine magnetism that allowed them to cross safely. But when another teacher attempted the feat, one of the boys fell and died. Swamiji was deeply aware of the situation of the woman who planned to cure herself by her own power. And in the vibration of truth that always accompanied him, it would have been difficult for her not to acknowledge that she didn’t actually have the power to effect a cure. There were myriad reasons why I enjoyed Swami’s company – above all, because it kept me wide awake all the time. It was difficult to let your alertness drop when you were around him, because of the powerful vibration of his absolute awareness that was always emanating from him. Thinking of the energy that we felt in Swamiji’s presence, it’s easy to imagine the unwavering concentration of those boys’ minds in Yogananda’s presence. The tragedy of the boy who fell and died happened because the teacher lacked spiritual power – he assumed that God would protect them if they simply said the right words, without putting out the necessary energy to attract the divine protection. The woman with cancer endured a course of medical treatment that prolonged her life, but in the end the cancer took over and she died. I mention her story because whenever we find ourselves in difficult situations, whether it’s a serious illness or some other condition, we often get wrapped up in pretending that we are larger than we are. It may be that we simply aren’t aware of what’s involved. “If I pray really hard, God will have to heal me.” Or we may pray dutifully, feeling that we aren’t showing proper faith unless we’re at least pretending to believe that God can help us. But we overlook the little part about needing to raise our energy and attune ourselves to the power of His consciousness, and to honor His will, and receive gratefully from His hands whatever it is that He wants to give us. If you were part of my generation, you may have had the experience, as a child, of watching your father shave with a razor in the morning. When I was a little girl, it was one of my favorite daddy times, because my father would be trapped at the sink, and I could spend time with him and talk with him, and we enjoyed those moments together. And it was on one of those occasions that I asked him, because I was raised Jewish, why Jesus wasn’t the Messiah. I said, “How come, Daddy?” while I watched him shave. In my mind’s eye, I remember how he fumbled for an answer. It was clear to me that he didn’t have the foggiest idea, and I realized that there were some things he didn’t know. My father was a constant help during my early life, and I was very devoted to him. But we all reach a point where we realize that what we would like and what would please us, to have Daddy always by our side, ready and able to answer our questions, might not be given. We spend a great deal of time trying to carve out a little space where we can feel safe, because one of our greatest fears is to be vulnerable. But there will come a time when the security of this world will fail us. And we need to understand how to deal with it. I want to give full credit to my parents, because I was raised very well. But they were not enlightened, and there were questions that I deeply wanted to have answered, even though my parents hardly knew those questions existed, much less being able to answer them. And so we leave the family nest and go out into the world and try to find the answers we need and make our lives work. And we do it for many lifetimes, learning many things in the process and developing many abilities. We learn how to get along at school, and how to get along with people. And the inner motivation that keeps us wanting to learn is a deep longing to expand our awareness. Because we know, with a deep inner certainty, that increasing our awareness will bring us greater happiness, and that we will never be fully satisfied until our awareness and our happiness become infinite. Meanwhile, we use our minds to try to figure out how to get along in this world, and over many lifetimes we develop a certain mastery over our physical circumstances. We wouldn’t be in this room, with these teachings, if we hadn’t already achieved a certain level of practical mastery, and discovered for ourselves that this world can never give us the happiness we are seeking. I’m going to talk about local politics for a moment. Those of you who live in Mountain View may be aware that there is a rent control measure on the ballot. And I’m talking about this because it’s interesting in the context of our Bible reading. I don’t believe in the government trying to run our lives, and I don’t believe that morality can be legislated. I don’t think you can make a million rules and create a perfect society. But I’m supporting the rent control initiative purely from self-interest, because our rents keep rising, and I want to pay less. But what also kept me involved was discovering that the rent-control movement was being run by people from the Spanish-speaking community who didn’t feel that they had the power to affect issues that were important to them, and who are now standing up for themselves. And I’ve been able to see from the inside that they are working very honorably and intelligently within the system to change their lives. In the midst of the incredible moral confusion of our times, I felt that it was a stand that I wanted to support, where good people were doing an honorable thing in a noble way. And even though I’m not in favor of giving government the power to tell us how to live our lives, I realized that it was in the best interests of these people to gain a victory, and I wanted to give them my support. We have so many impulses, and it isn’t always easy to know which way to turn. So we have to keep looking for true guidance. I was in my late teens when I discovered the spiritual path. It was about two years before I met Swami Kriyananda, and I recognized it instantly. I thought, “This is it. I know this story. This is what I’ve been looking for.” It has taken me the rest of my life to fill in the details, but I had the great good fortune to find a place where someone did know the answers, and it became my constant touchstone for evaluating what is true. I found an unchanging reality of absolute wisdom, and even more powerfully, a teaching that was not based on dogma or a demand for unquestioning belief, but on actual experience. The spiritual path is not a question of choosing one side or the other according to our personal tastes, or because someone hands us a set of rules. “This is what you must do. Rent control is good, rent control is bad.” People are always disagreeing, simply because what’s forward for one person is a step back for another. During this little political cycle, I really wanted to help, so I ran around knocking on doors for a while, and the first time I did it, I thought I would die from boredom because it was so terminally dull for me. There was a feeling that it wasn’t what I was supposed to be doing. But I went to the meetings of the tenants’ coalition, and I could see how exhilarating it was for these people to stand up for what they needed, and to go around knocking on doors. 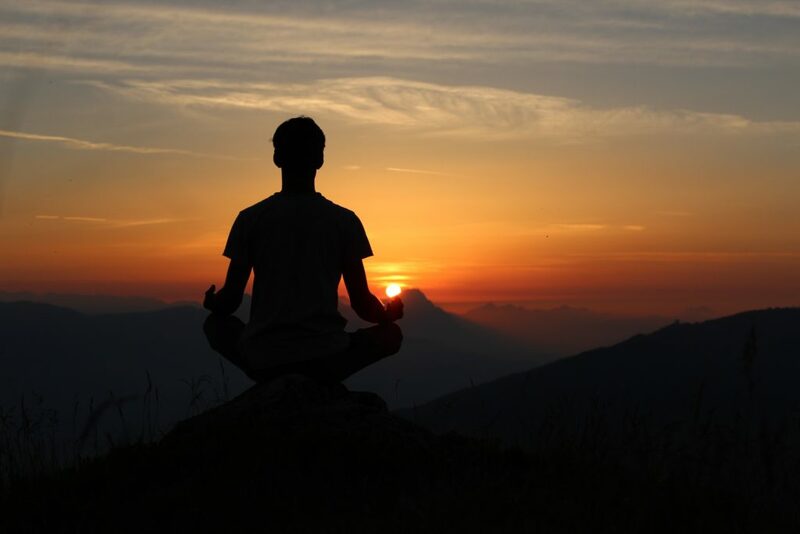 And the thread here is the need to find that which will help us get in touch with the inner power of the Divine, and realize who and what we really are. This world is given to us because God wants us to participate in it. There are very few people who can live as hermits, spending all their time meditating, with hardly any outward involvement. That is a very different stage of spiritual evolution than we find ourselves in, where we need to learn by having many experiences, raising children and having our hearts broken and acquiring a comfortable home. And, through it all, we have to understand that God doesn’t ultimately care about any of it, except as it will help us keep moving toward Him . When we read the Bible passages that seem to be telling us that all we have to do is open the door and God will come in and save us, we need to stop and remember that it isn’t really all that simple or easy, because we must have a growing awareness of God’s presence within us before those kinds of things can happen – before God can come in and sup with us. And the process of gaining the inner awareness of His presence is very different and much more difficult than simply praying to have things work out in a way that will please us. It’s a distinction that I’ve come to appreciate over the years – that we may be feeling happy in the knowledge that God is taking care of us, and pleased by what’s happening. But to have the same feeling of unalloyed happiness in the awareness that God is taking care of us when nothing that’s happening is pleasing us – that’s when we’re challenged to look for the unifying thread that will give us a level of unshakable equanimity amid the ups and downs. That’s the real question. And as I began to understand this path, I saw that the unifying thread is Self-realization. I am bound and confined and limited by things that I don’t even know are there. I keep trying to untie the knots, but I can’t even see what’s binding me. Yet there is a growing awareness of God’s presence inside me that is gradually releasing those inner bonds and driving the darkness away. I’ve watched many souls reach the end of their lives and face the inescapable fact that they will be denied much that would have pleased them. And it forces you, in the best possible way, to continue to seek and demand – not what God can give you, but what God wants. God can do anything, but He will not work against our best interests. And that’s often what we’re demanding, that God work against what’s best for us, just this one time. This is why our prayers have to be synchronized with a growing awareness of God’s presence within us. We have to be real, and then gradually reach a level of awareness where we are able to pray with great love and sincerity, and with complete self-offering to His will. When I was about thirteen, I was riding a horse and fell and broke my arm. I remember seeing my arm bent into a shape that nature hadn’t intended, and how a wave of fear shot through me. They called my mother and we went to the doctor, and the doctor kept telling me how much it would hurt when he set my arm. And by the time he barely touched me I was hysterical with fear and screaming even though it didn’t really hurt very much. And even as I was screaming I remember noticing that my mother was looking far more distressed than I was, because she couldn’t help me. And even as a thirteen-year-old I remember understanding that she was suffering more than I was. What we are seeking is the blissful presence of God, and the wisdom to know that what He is trying to give us is what we most truly want. We are forever wanting our situation to be different than it is. When Ganesha’s son, Mukunda, was about three years old, he lived with his family in the Ananda ashram that we had in San Francisco for about ten years. It was in a five-story mansion, and there was a huge wooden staircase that turned the whole house into an echo chamber, so that when people talked in the halls you could hear it all over the house because of the marble walls and wooden floors. Mukunda woke up early one morning, and because he was feeling terribly bored, he crawled out of bed and stood in the middle of the staircase on the fourth floor. Even as an infant, Mukunda had a powerful will, and in his loudest voice, he yelled, “I want it to be morning!! !” And of course the entire house woke up. I’m bored. I’ve had it with nighttime and I want you all to get up. I want it to be morning. Well, honey, it isn’t, and what are we going to do about it? We may have an idea that our situation is terrible, and we may have a hissy fit about it, as I did when Swami gave me that assignment. What was so frustrating to me was that I knew I would have to adjust. And it’s all right to have a reaction, but don’t doubt for a moment that Divine Mother has a better plan for you than you could possibly imagine for yourself, even though the way forward may seem dark and scary, and the worst possible choice. I love the phrase, “After a time.” How many days and nights and lifetimes are encompassed by those words? And then the tiny rebel surrendered, and how often have we felt like that rebellious little bird? On the other side of the darkness there is light. Always – always! – there is the great light of God.